Here's a fun game: let's list every single thing we know about Finn so far: he wears Stormtrooper armor. Oh, and he also hangs out with that not-Luke girl. If you know anything more about him than that, then hey, congratulations on ruining your movie-going experience by going looking for spoilers (or, unfortunately, by spending time around people who will unthinkingly spoil things for you, in which case that's their fault, not yours). Honestly, what is it about enjoying a story the way it's meant to be told that some people find so hard? If JJ Abrams, Lucasfilm, or Disney wants you to know something, believe us, you'll know it. Finn is played by Ice-T. Wait, no, that's Law & Order. Finn is played by John-Boy Walton, who was never on Law & Order. Okay, there's no way that's accurate. [You're right, it isn't: he's been on L&O three different times --ed.] Last try: Finn is played by John Boyega, who has also been on Law & Order, but only on the UK version, not one anybody's ever seen. 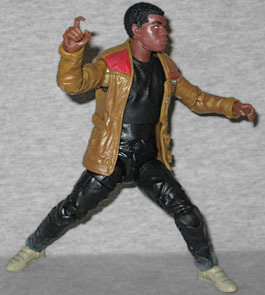 The sculpt does look fairly like Boyega, but it also looks quite a bit like a young Tracy Jordan (who, you'll note, was a Jedi). 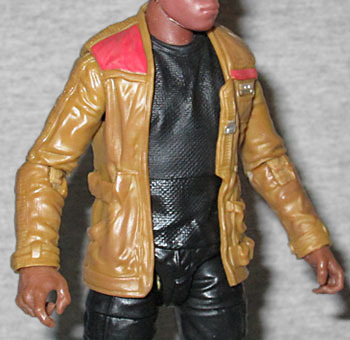 Apparently not wanting to rub it in the racists' faces just yet, Hasbro has not made Finn wearing his Stormtrooper armor (although, as Monkey Boy discovered, his head will fit nicely on the new Trooper's body, if you can find one). Instead, the figure is wearing some simple civilian clothes that wouldn't look out of place in the world today. He's got a tan jacket, a black shirt, black pants, and white shoes. Well, whiteish. They seem to be caked in dried... sand? Snow? Something. If you look closely at the outfit, though, there are lots of Star Wars-y details, like the ribbed panels that run all the way up the arms, the texture of his shirt, or the fact that his shoes look like they belong to a 1970s nurse. In the two years that Hasbro couldn't get a single new Black Series figure onto store shelves, the paint apps have apparently gone way downhill. 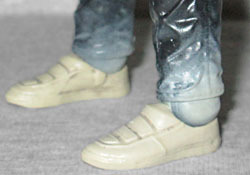 Compare the sandy paint apps on Finn's legs to those on the Sandtrooper, and notice that his shirt is a different color above the chest joint than it is below it. And even that's backwards, because the shirt should be a darker black than the pants are! There's no kind of wash on his jacket, but we're probably lucky that the red and silver bits actually get any apps at all. The toy's articulation seems up to par. Let's compare him to one of those two-year-old figures you can still find in every store, Han Solo: peg and hinged shoulders, elbows, wrists, hips and ankles (pegged on the foot side so they "rock"), as well as a balljointed chest and head, hinged neck, peg thighs and double-hinged knees. Yep, all the same joints! It might have made more sense to put the chest joint lower down, at the bottom of the shirt - then it could be all one color, and wouldn't have a giant seam through the middle of it. 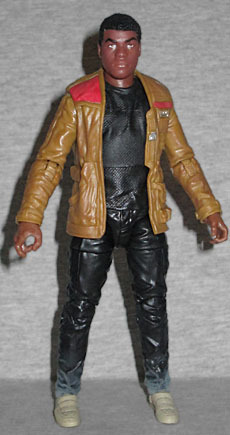 Finn's left hand looks shaped to hold a lightsaber, though none is included; his right hand has the trigger finger extended, so he can hold his included Super Soaker. Oh, I'm sure it's a blaster or something, but it was just so clearly designed to be turned into a toy gun come merch time that it's ridiculous. Also, is it supposed to be tan like this? The version of Finn sold at the Disney Store has the same gun, but it's silver and black. I guess we'll just have to wait three more months before we find out! And that, right there, is the problem with "Force Friday." It's an effort to recapture the merchandising magic of the original "Midnight Madness," but Midnight Madness took place on Monday, May 3, 1999 - Episode 1 then opened on May 19. That's two and a half weeks from toys to movie. This time Force Friday was on September 4, and Episode 7 opens in December. It's more than 100 days away! That's nuts! Of course, maybe if there had been a longer sales window before people saw The Phantom Menace, there wouldn't have been such a glut of figures left on shelves? That certainly wasn't a problem with Force Awakens toys, which experienced thorough sell-outs everywhere on their first day of release (and no, conspiracy nuts, that doesn't mean Hasbro is out to get you).